Vit Horejs with the puppets of Johannes Dokchtor Faust. Photo by Jonathan Slaff. BOTTOM LINE: A light-hearted retelling of the classic Faust story using historical marionettes that unfortunately lacks some of the potential magic. I want it on the record that I enjoy puppets. I’m a huge fan of all things Henson, and my father collects vintage marionettes, so you will find no stigmatization of the puppet arts in this review. 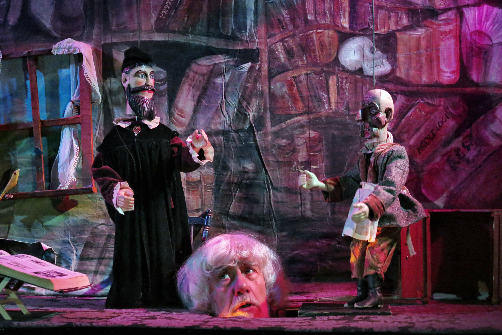 My enjoyment of the limitless imagination of puppetry, even when done simply and without high-flying effects, is why I was ultimately disappointed by the Czechoslovak-American Marionette Theatre’s production of Johannes Dokchtor Faust, now playing at Theater for the New City. This play is a recounting of the classic deal-with-the-devil story, where a man named Faust (writer-director Vit Horejs) is so learned, and blessed with such a high and mighty intellect, that he decides to challenge himself through dedication to the demon arts! By way of a contract with a devil named Mefistofl (Deborah Beshaw-Farrell), he achieves all of his mischievous desires, pranks, and spooky scares. Along with him are his stern servant Wagner (Michelle Bradshaw) and the impish youth Pimprle (Jane Catherine Shaw), whose puppeteering includes great physical comedy and one-liners that are hilarious in the first several scenes. This Faust starts off well—at the beginning, the script and performances manage to thread a charismatic balance between inherently spooky gothic imagery and light-hearted screwball comedy. From the first accordion notes and beats of a drum I was on the play’s side and excited to see more. Each puppeteer introduces him or herself by stepping out in front of a raised puppet stage with the air of a group of less-than-professional traveling players. This riff on the amateur performer, one who may not be “trained” but performs for passion’s sake, is clearly intentional given the sight gags and purposeful slip-ups by the performers. Unfortunately, as Faust continues, the vulnerable comedy of community players becomes less charming. From some wooden line readings to haphazard puppet manipulation, and a lack of fully realized creative ideas, I found I wanted to like the play much more than I actually did. This is not to say Faust isn’t charming. And it certainly comes from a strong performative lineage. The marionette puppets themselves are pieces of performance and art history, and the whole presentation is linked to a long cultural tradition. These are true merits of both this show and the art form on which it draws, and will appeal to folks of all ages. However, there is nevertheless a lack of magic in this particular supernatural offering. The pockets of brilliance largely occur in the first half. One particularly stunning moment occurs when Faust ventures into a forest to do some diabolically dirty deeds to summon a devil. The curtain raises to reveal a puppet-sized summoning circle surrounded by giant grey trees towering in the background. But ingeniously, as the trees start to sway, we see they aren't pieces of set construction, but the puppeteers’ legs clad in denim jeans, some with rips and weathering reminiscent of the gnarls of old bark. The atmosphere is heightened by seeing not only the puppeting of these characters, but also a set created through the puppeting of the puppeteers’ own selves. It shows both real artistry and real heart—the kind of creativity, cheeky inventiveness, and sense of play that I wish were present in the rest of the work. Johannes Dokchtor Faust is translated and adapted by Vis Horejs, refashioned from the Old Bohemian. Directed by Vis Horejs. Music by Melissa Elledge. Costume Design by Michelle Beshaw. Backdrop and Costume Painting by Beatrix Piesh. Lighting Design by Federico Restrepo. The cast is Michelle Beshaw, Deborah Beshaw-Farrell, Vit Horejs, Jane Catherine Shaw, and Ben Watts.